Does the seasonal shift to shorter days and the clocks going back affect your mood? I have to say that it definitely affects mine. I always find this time of year to be fairly tricky to navigate. As nature retreats to its bed to start its annual, winter hibernation, the world seems a little less bright and colourful. I suffer from Seasonal Affected Disorder and I can really struggle with the reduced daylight hours and often diffused light. Over the years I’ve found a number of solutions to help my Seasonal Affected Disorder. One particular solution I’ve really adopted is to purposely wear bright colours and fun patterns. I harness the joy that wearing colours and prints bring me, to help lift my mood, especially on days when all I want to wear is a duvet, whilst horizontal. It’s not a cure all but it helps to make me feel more positive at this time of year. There’s no doubt that colour can influence our lives in more ways that we perhaps imagine. I’ve always been naturally drawn to bright colours or rich, luscious ones such as the jewel tones and in the winter months I make an effort to gravitate to them even more. For many people, blue is their favourite colour and it certainly is mine. I LOVE blue – every single shade of it from the palest, most delicate baby blue to the dark, inviting depths of midnight navy. Some people find blue a cold colour but I find it an energizing colour to wear, especially cobalt blue. For me, cobalt blue is an immediate, pick-me-up colour for any outfit! I can never resist an unapologetic print and the shirt I’m wearing is certainly not shy in proclaiming itself. I am normally ambivalent about wearing clothes with hearts on them for fear of straying into the territory of ‘twee’, to be swallowed up by a mist of saccharine. And if you’re a petite, you want to avoid at all costs, looking or feeling ‘twee’! But these hearts could never be described as twee! They are big, bold, life-affirming, smile-inducing hearts and I love them! I’m not just wearing my heart on my sleeve but all over my torso! Best foot forward and all, we’ve places to go. You see, Tall Brown Fox and I were having a Date Day when I wore this outfit recently. Yup, Date Day, as opposed to Date Night. I often work 4 nights a week so come the weekend I often want to stay home in the evenings, hence Date Day at the weekend. We hadn’t been to the cinema in months, so we treated ourselves to brunch and a movie. Now some people might say that I look fairly dressed up for just brunch and a movie! My job involves wearing casual clothes all week and certainly never skirts. At the weekends, it’s often a welcomed break to up the sartorial ante. I also find that if I make a little more effort in how I dress, the mental and emotional boost it gives me, helps my S.A.D. 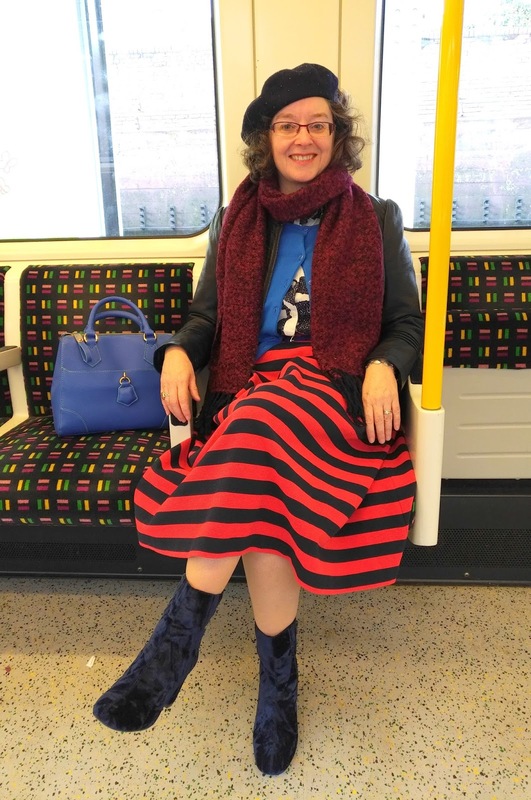 And a skirt is all the better for showing off my blue, utterly fabulous-in-every-way velvet-y boots, don’t you think? … gazing longingly at all those divine 1930’s costumes! The bejewelled dresses, the beautiful tailoring, the sharp 3 piece suits. Somehow, dressing with a little more attention to detail seemed fitting with the choice of film! And we’re off… on the underground. My bag was smugly pleased to be able to have a seat all to itself, as we zoomed towards our destination. And once we’d disembarked, we found these pretty posters on the platform. 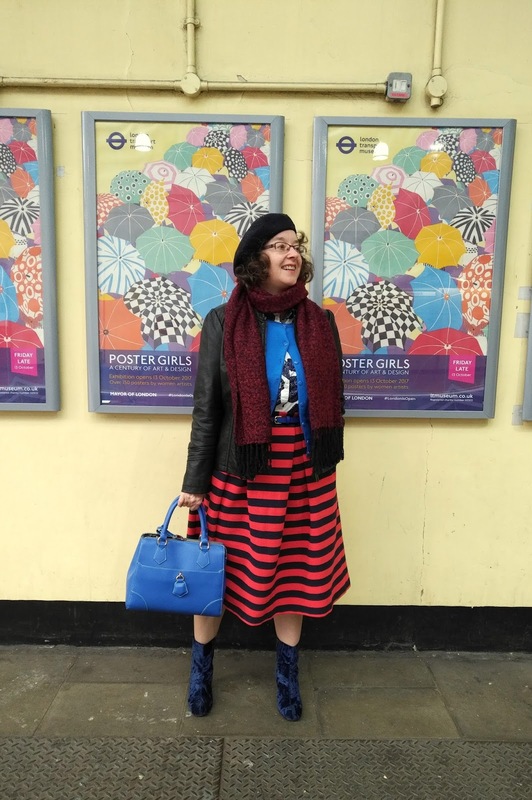 Can I be a ‘Poster Girl’? Note to self – add Poster Girls to my list of exhibitions to see. I love the patterned umbrellas, mixed in with the bright, mono-coloured ones. I’m feeling very at home! What patterns work best with each other? If you’re starting out exploring the delights of pattern mixing, it can feel more like mayhem than mixing. Choose the easiest pattern to mix – Stripes. Well, the simpler the pattern, the easier it is to mix. Stripes simply go with everything, even plaid! I consider stripes to be practically a neutral, just as these days leopard print is considered a neutral. A striped skirt will go a long way in your wardrobe, being equally at home with plain or printed tops and is a good base for pattern mixing. Mine is a classic A-line, with pockets that go on for days, a nipped in waist and flattering box pleats that skim the hips. It’s from one of my favourite brands – Boden BUT I bought it second hand for a song! Next, choose a pattern for your top half. Florals are a match made in heaven with stripes or you could go for a geometric pattern such as I did here with my Polka dot Jumper and Striped Skirt outfit. Stepping it up a notch, you can do Florals and Checks. The simpler the pattern, the easier it is to mix! With the evenly repeated stripes, my skirt can take a slightly larger than life pattern. In fact, the skirt almost cries out for a more show stopping partner. My navy hearts shirt is an unusual and striking design; the ideal companion. And even thought the hearts are topsy turvy, angled in all directions, a little disorderly, because they are an evenly, repeated pattern they still work in harmony with the regular, more orderly stripes below. It might be Autumn but I can just about get away with a 3 quarter length sleeved cardigan – all the better for a flash or perhaps flush of hearts. I’ve read lots of so called ‘rules of pattern mixing’ and boy, are some of them overly complicated. I end up being more confused than when I started! Just keep it simple and don’t over think it. – Link colours and tones rather than patterns. – Think about the scale of your patterns. If you want one pattern to be more the focus, with the other being an accent, just pair a bigger one with a smaller one. If you’re top heavy, better to keep the bigger pattern in the lower half. – Equally, patterns the same size can work together. Done well, they actually balance each other. – Another neat trick to pull a pattern mixing outfit together is to have one bold or solid colour, in a couple of places to add visual contrast and depth. The cobalt blue of the cardigan, bag and belt does the job beautifully here, against the darker colours of the navy and red. – Take accent colours through to your accessories. By now it would have been a total anti-climax to opt for a neutral or basic colour shoe or boot. Black would have been dull, dull, dull. I was on a colour roll! Besides my crushed velvet boots wanted to join the fun. Can petites wear bold patterns? Of course! If they suit your style personality, as it does mine. I never understand when I read that petites shouldn’t wear bold or big patterns. If the cut and fit is good, then you won’t be swallowed up by the patterns. My philosophy is, if you’re going to pattern mix, then don’t be half arsed about it. You can choose to mix a small print with a big one, or as I’ve done, two evenly sized prints, doesn’t matter. As along as you start with a common colour, you really can’t go far wrong. And if you love colour, throw in one that’s a real tonic for the eyes and soul! Grab yer patterns with both hands and run with them. Figuratively and literally! I have no idea what the heck I’m running from … or even to … but I do look like I’ve got to be somewhere. With my big, unapologetic hearts. To the cinema, no doubt. I need to buy my pix ‘n’ mix. And the film? Brilliant. Go see. The period detail is faultless, incredible and visually stunning. And the sight of the moustache that Kenneth Branagh sports as Poirot is worth the ticket price alone! What prints and colours do you like to mix? Are there certain colours that never fail to make you smile? Wow! What a combination. I said it out loud actually. What a fantastic outfit, I adore that skirt but the way you styled it is just fab! Thank you Nancy. I'm smiling at the thought of you saying that out loud! what a lovely outfit, I love every single ítem and love even more how they work together so nicely!, lovely stripes and prints, lovely booties, lovely blue shades!. Totally inspiring! I'm a huge fan of Red color, and also a huge fan of the motto 'when in doubt, wear Red color', and wearing red always makes me feel more Me!. I agree with you: wearing bright happy colors could help us to manage that Winter dullness!. I've been suffering from asthenia and your advice was very useful! I'm blushing, Monica at your lovely words! Thank you. Yes, I agree about red – an invigorating colour! I think you look incredible, Jacqueline!! And we should all wear bright colors to help our mood! It may not be the cure, but it certainly can't hurt!!! Thank you Jodie. I did feel rather glamourous and Tall Brown Fox loved the outfit so win, win! I'm a first time visitor, saw your link on The Style Splash link-up this morning…but this is such a fun outfit I will definitely be back to see more! Ha, ha, yes, there's a whiff of the Frenchy about it, isn't there? And not just the beret (which is my signature note!). How lovely you've stopped by – thank you. Hope to see you again. And in the Winter months, we all need some cheer! Jacqueline, as if I didn't already suspect your sartorial genius, it is now officially confirmed! This outfit combination is absolutely and completely a work of art! I adore the colors, the boldness, the patterns, and the unapologetic way in which you are flaunting your stunning self with well deserved pride and ownership in the outfit you have created. Fabulous, my friend! 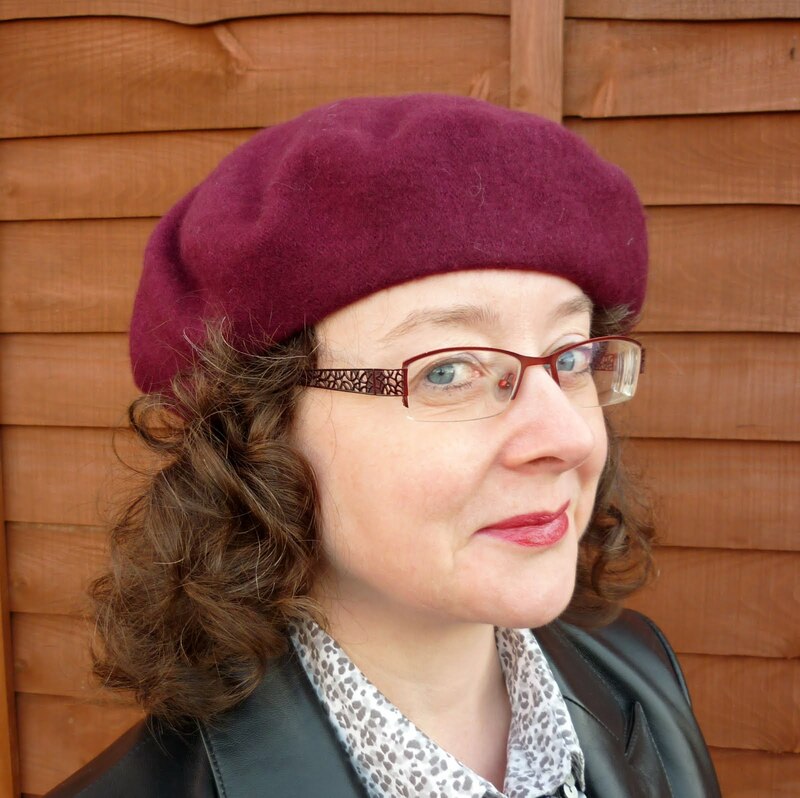 And by the way, I have finally purchased my first beret. I went with basic black to start and it will be making its debut on my blog this Thursday. And now, I want more, more, more. A beret in every color. Perhaps Black Friday will present me with some amazing deals on berets! Oh Shelbee, that is fulsome praise indeed. What lovely compliments! This outfit does seem to be catching people's eyes and I'm truly grateful for that as I loved wearing it. Yes, be unapologetic is where I'm heading! So excited, as I mentioned on your blog about you getting your first beret. May it be the first of many and that you have many happy hours wearing it. Once you start your collection we can have a 'beret' off!! This was a real sitting down with a cuppa, catch up with your girfriend post and how lovely it was too! I'm currently struggling with SAD so this couldn't have come at a better time to remind me of some of the best ways to ease the discomfort of the condition. You look stunning in all of these hues of blue, the bag being my favourite. Great pattern play too; it's all expertly done! It's such a killer SAD, isn't it? Can really slap you in the face but we fight on as best we can using any tricks at our disposal. So glad you enjoyed the post, especially as you are brilliant at pattern mixing. I hope you had a delicious slice of cake with your cuppa or some tasty morsel to accompany it! I have more pattern mixing posts planned. This look really ups the mood! Love your pattern mixing! That skirt is such a great piece! It looks fabulous paired with cobalt! Thanks Laura. The skirt is a staple in my wardrobe! I love a good midi skirt! Print and color mixing done so well! Thanks Amy. Glad you like it. Super pattern mixing and colours. Guaranteed to bring a smile. I;m glad I'm not the only one who finds autumn and winter a bit depressing. Autumn is over too soon and quickly becomes the season of decay. Winter is bare and clean, but also in the UK relentlessly damp and grey – very rarely cold and crisp, or a winter wonderland! Thanks Gail. You're so right, Autumn is over too soon and I rather bored quite quickly of all the autumnal colours and cobalt blue is such a shot of colour. What a wonderful outfit, not only would it cheer you up , it could only make those you come in contact with smile too. Your pattern mixing is spot on by using the same colour group.I hope you enjoyed your movie. Sending some sunshine your way. Thank you for your lovely words Jill. Yes the movie was hugely enjoyable. I can highly recommend it. In my opinion this is YOUR BEST OUTFIT yet. I love everything about it and how you mixed so many trends, colors and textures and it worked. The skirt and boots especially are so gorgeous! Hope your Thanksgiving is awesome. Welcome by and join my linkup now! Thank you so much Ada. Yes, I think it's one of my favourite outfits too. I have a big crush on the boots at the moment! I will swing by and link. I just LOVE everything about this outfit! The skirt is fabulous and the mix of stripes and the heart print shirt is spot on. Gorgeous velvet boots and beret too. Thank you for linking up Jacqueline! Oh thank you Emma. Yes, the skirt is a favourite and even better for being bought 2nd hand for a snip! Thanks Nicole, yes colour does indeed fight bad moods! Very lovely outfit! I love the mix of prints and hope to do that more from time to time. The colors are perfect for brightening up the day. i am not a fan of the shorter days and darkness, and it really gets to me after the holidays. Thank you Jess. She shorter days are certainly harder to deal with but I console myself that once we're pasted the shortest day in December it's all on an upward curve till Spring! I'm loving pattern mixing at the moment. It's so much fun. I am a bit late to the party, but want to say I thoroughly enjoyed your post. And I think you did so well in pattern mixing. Love this bold outfit on you. Applause to Tall Brown Fox for his camera skills.